However you like to spend your leisure time, Columbia Pointe Apartment Homes provides extraordinary amenities to help you unwind. 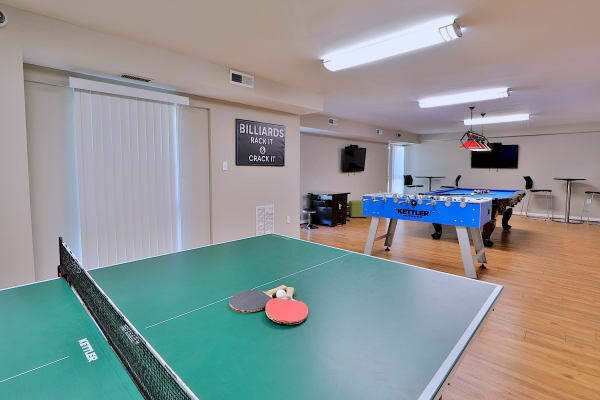 As a resident of our Columbia, Maryland, apartments, you can enjoy your favorite activities without leaving the grounds. In the summer heat, cool off at the beautiful outdoor swimming pool and sundeck. For an early-morning workout, stop by the modern and fully-equipped fitness center. On your way out, visit the community coffee bar in the luxury clubhouse for a caffeine boost. Our pet-friendly community also boasts an on-site dog park where your pup can play fetch and meet your neighbor’s pets. For more opportunities to meet your neighbors, check our community calendar for upcoming social activities. Let Columbia Pointe Apartment Homes be your home for comfort and leisure. Call our team today to schedule your VIP tour of our Columbia, MD, apartments near The Mall in Columbia.